SCaTINDIA 2018 featured participation from more than 300 companies and attracted about 19,000 cable professionals around the world. The list of exhibitors ranged from CATV hardware manufacturers to broadband service and technology providers to pay TV channels, system installers, component suppliers, fiber optic cable manufacturers and satellite broadcasters. 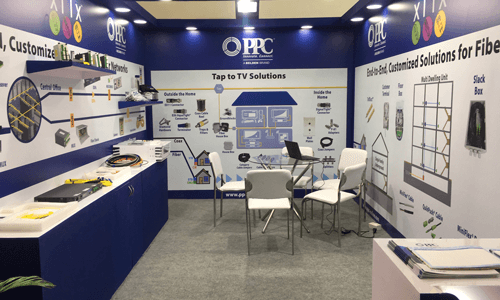 For PPC Broadband, the exhibition provided an opportunity to showcase some of our most popular broadband connectivity solutions, with attendees being able to view and handle samples of coaxial cable, category cable, and SignalTight® and AquaTight® connectors. 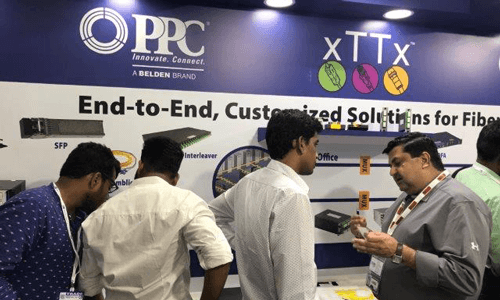 Members of the PPC team also demonstrated the company's end-to-end fiber portfolio including our headend fiber management products, high density passives, cabinets, fiber transport and optimization equipment, fiber demarcation enclosures, Miniflex®, QuikPush® and custom cable assemblies. According to the organizers of SCaTINDIA 2018, the Indian cable TV industry is currently the second largest cable TV market worldwide and is expanding at a rate of approximately 8% to 10% every year. Some 120 million Indian homes currently have access to TV, with 90 million accessing CATV, and the vast majority also being equipped with fiber and digital capability.